So you have discovered the natural wonder of aquariums but have no knowledge or experience? Choosing a good aquarium can be challenging because there are limited options for different sized tanks. Any good fish aquarium is made up of a tank material that can withstand the strong force from inside and outside. It is relatively easy to maintain and achieve a healthy aquarium. Other than being just a fascinating addition to any home or office, 20 gallon fish tanks can generate appreciation and respect for your environment. 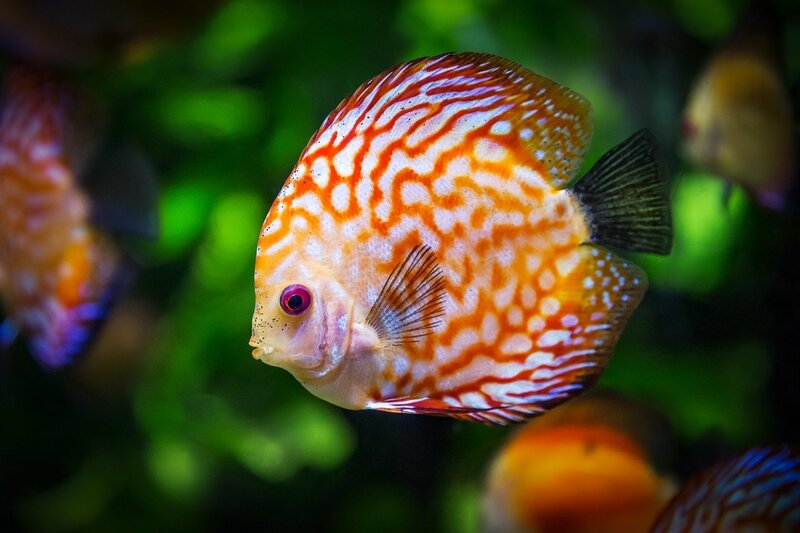 Therefore, keeping fishes as pets deserve the best care and attention you can provide. Freshwater fish are by far the most popularly followed branch of the hobby. Perhaps the main reason is that many fish keepers prefer creating a freshwater aquarium where the focus is not only on fish but also on aquatic plants, as well as ease setup and maintenance and overall cost. Besides, a freshwater fish tank offers the benefits of being fun, easy and instructive. On the other hand, a saltwater fish tank has more specific needs and requirements to maintain, but is very rewarding once setup and running smooth. This is attributed to the fact that saltwater fish can be more expensive as well as extra equipment required. A saltwater aquarium, as with freshwater, can keep either coldwater fish or tropical fish (warm water). Both can be kept at home, but coldwater tend to be harder to maintain and more expensive to setup due to needing to keep the water cold, but very rewarding once completed. It’s definitely not hard, but does take some extra planning. 20 gallon fish tanks are great for any beginner as well as experienced aquarists, regardless of type the type of fish and water conditions you choose to keep. However, make sure to keep some simple things in mind when making a decision. Material type, glass or acrylic, is an important decision due to both weight and ease of breaking in high traffic areas, especially with pets or kids. Make sure to put it on a sturdy stand or desk. A heater will be an important purchase if the kit does not come with one. 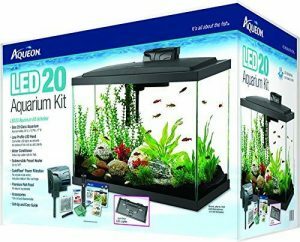 A good 20 gallon aquarium comes complete as starter kits, but many still require additional accessories. 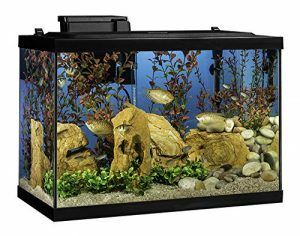 In this article, we present the best 20 gallon fish tanks and 20 gallon aquarium kits. This 20 gallon aquarium is a great tank for someone looking for an “all you need setup”. Its 12v 5.2w LED light gives a natural light that resembles the real condition which makes your dream of having beautiful fish come true. It works very well for live plants as it provides enough light for them to grow fast and healthy. It has a 20 gallon aquarium hood made of the canopy which protects the aquarium from unwanted objects and debris that could fall into the water. It has a hole that makes feeding easy. The filter has four different cartridges that provide adequate water conditions. Moreover, the filters are quiet and easy to change. A water conditioner is also included as part of this 20 gallon fish tank kit, which is very important for fish and plant health. It is important to note that freshwater and saltwater fish cannot survive on tap water exclusively. The water conditioner strips out the toxic chemicals that fish can’t live in. Its 25 lb weight makes it stable, solid, and not overly heavy. The best location for the set up of either a freshwater fish tank or a saltwater fish is away from any heat source, air conditioner, and direct sunlight. 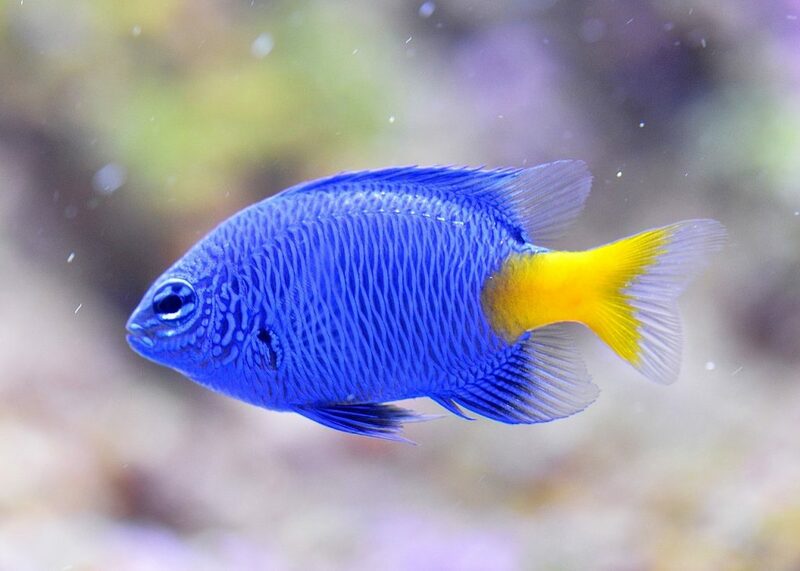 If you decide to keep tropical fish, you will need to purchase a heater as it does not come with one. One minor issue is that the glass is stuck together using black silicone which can make it stick out. This aquarium is mostly known for making bold statements once put in any room. It is strong, its dimensions (24.2” L x 12.4” W x 16.7” H) render it rectangular in shape, and it comes in three color options. It has a LED aquarium hood which creates a lighting fixture and enhances decoration. The Tetra Mini UL heater is essential for maintaining appropriate temperatures in the your fish tank, however, this heater is not adjustable. We recommend purchasing an adjustable heater instead. Healthy happy fish require just the right amount of solutes in it water hence it is important to maintain the right water composition. The Tetra Whisper 20 filter in this 20 gallon long aquarium delivers adequate filtering for fish and plants. Moreover, this fish tank has the right 20 gallon aquarium dimensions that will accommodate the four artificial plants that come with it or any live plants you choose instead. The artificial plants not only provide relaxation and hiding spots for the fish but also act as decorations. The artificial Boxwood Plant Mat that comes with it assists with circulation of the system. Water testing strips are included in the kit, which you will need to correctly test the quality of the water. Other items include an air pump and a bubbler which you may use to make the fish feel at home and help to keep them happy and stress free. This is definitely a great 20 gallon fish tank for sale for any and all fish enthusiasts. Its dimensions (12.5 x 24.2 x 19.5 inches) allow you to keep fish at home or in the office. Its LED light provides great blue light that gives the room a beautiful ambiance. This light is suitable for plants that grow well in the dimmer light. It is important to note that too much light deteriorates the life of a fish. Regardless of where you put it; in the living room, bedroom or even the office, this great looking aquarium will be admired by your guests. Another important property is the quiet flow filters that keep the water clean while allowing the natural microorganisms to thrive. This filter contains cartridges that act as both mechanical and chemical filters. The filters and conditioning system ensure that the concentration of solutes in the water is favorable for growth and development of the fish. 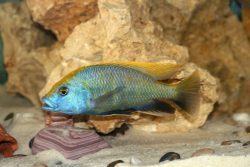 Once in a while, the fish are prone to succumb to unwanted death due to ingestion of certain compounds that do not suit their body metabolism. To prevent this, it is necessary that you pay attention to your filter and conditioning system, and provide regular water changes. 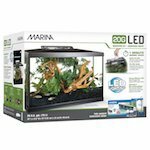 A heater is also part of this 20 gallon fish tank kit which is used to maintain the temperature depending on the type of fish you are keeping and the ambient temperature of the environment. This kit does come with water conditioner, a fish net, and even a small sample of food to get you going. This is a kit that has the combination of an attractive design and functionality. 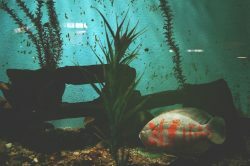 Fish kept in this aquarium have a beautiful color as a result of the lighting fixture created by the 18-inch, 15-watt Sun-Glo Fluorescent bulb. This LED light not only intensifies fish color but also promotes plant growth in the aquarium. Along with the light is a sleek designed and styled canopy. The 20 gallon fish tank dimensions for Marina Style are the 12-inch length and 24-inch width with the height is 15 inch. When and if you need to increase the size of your fish community, there is room for more as long the water conditions are maintained depending on the type of fish you decide to keep. Just like the name suggests, Seaclear provides a beautiful clear view of your fish while having almost no obstructions due to seamless edges. It comes with is a combination of a reflector and a 15 inch light fixture and is one of the best brands when it comes to acrylic tanks. You have a choice of three colors for this setup. 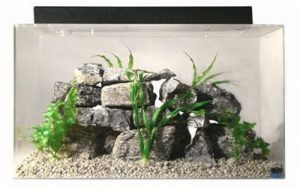 This 20 gallon aquarium kit is made up of a clear acrylic with features that make it attractive while being stronger, lighter, and safer than glass. For beginners who love clarity and beauty, this is an excellent choice. It is suitable for both freshwater fish and saltwater fish but comes at a slightly higher price. The aquarium hood also has a smaller opening compared to some of the other tanks on this list. Its half moon shape will certainly spruce up things taking attention away from your usual rectangular fish tank. It is a worthy price of décor for your home that will attract any visitor to walk over and view it. The glass provides a beautiful ambiance of your fish and décor. 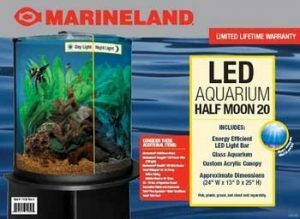 Marineland half-moon is one of the best-LED hoods for your tank. The LED light has 42 white and three blue LEDs that features a 3-position switch: on, moon light (blue), and off. The blue light is fun as it will provide great lighting effects for enjoyment while allowing your fish to prepare for rest by mimicking the moon. We recommend turning this on 30 minutes before you turn the aquarium light off. The hood is made up of a clear plastic canopy. The dimensions (24” W by 13”D by 25”H) of this exceptional 20 gallon tall aquarium are designed to provide the most wonderful experience for its owner. One issue is that it does not come with a filter while most other aquariums do. The size of the aquarium: This is determined by the type of fish you decide to keep. 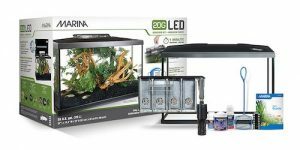 We hope this guide has provided you with everything you need to make your decision on which of the best 20 gallon fish tanks and 20 gallon aquariums is the right one for you. Please let us know if you have any questions or comments about one of your 20 gallon fish tanks, as we always enjoy hearing your experiences.